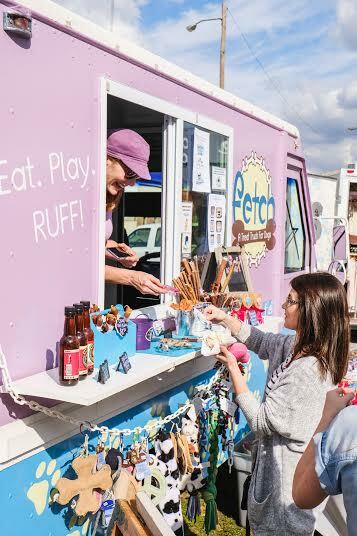 Allison Whitfield-Smith’s food truck FETCH, A Treat Truck For Dogs, is a place for dogs to enjoy a variety of treats, including ice cream. What started out as a simple love for dogs has become one of the most unique businesses in the Magic City. For Allison, however, the business is still about her love for dogs and community. Where is your favorite place to park your truck? I don’t know if I have a favorite place to park. I enjoy all of the events I get to participate in and seeing all of the dogs. The food truck rallies and Pepper Place Market are both great places to see lots and lots of dogs. What are some of the most popular flavors of ice cream? I offer both peanut butter and maple bacon. Typically, the humans get peanut butter more often for their dogs because they generally know their dogs like peanut butter. I find that most dogs like them both! Why do you like to have a strong presence in your community, like helping local animal shelters? I believe it is important to give back and be a part of your local community. Starting a new business takes a lot of my time, and I’m not able to do some of the volunteering I’d like to do. Donating monetarily to the local shelters and companion animal groups is a way to give back. In addition, I will regularly post about some of the dogs at the local shelters that are looking for their forever home. I am grateful for the opportunity to help the local shelters and companion animal groups and participate in their fabulous events. One of the funniest customer experiences was at an event where a woman brought her dog over for some treats and when it was time to go, the dog did not want to leave. She tried pulling her but the dog rolled over on her back and refused to get up. The woman eventually had to pick her dog up, throw her over her shoulder and walk away. The dog was howling like a two-year-old throwing a tantrum when told they have to leave the candy store. What upcoming events are you looking forward to being a part of? The spring is full of great events! We just participated in FidoFest at the Summit, April 8, Mount Laurel Spring Festival & Talladega Block Party (night), April 9 Avondale Food Truck Rally, April 15, Hand in Paw Mutt Strutt, April 22, Episcopal Place Gumbo Gala, April 29 and Celebrate Hoover. I will also be at Pepper Place Market many weekends this spring and summer and at various breweries around town.